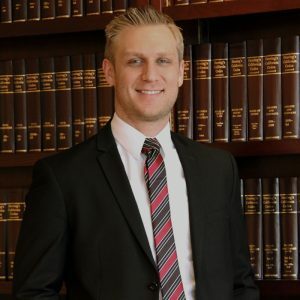 Steven Ogden is an associate attorney with the Law Offices of Michael J. Gurfinkel, Inc. Attorney Steven Ogden is admitted to the State Bar of California and is licensed to practice immigration law across the United States. He received his Bachelor of Arts degree in Political Science from the University of Southern California in 2009 and his Juris Doctor from Loyola Law School in 2012. In law school, Attorney Ogden focused on trial advocacy. Since passing the California State Bar, Attorney Ogden has practiced exclusively in immigration law. He has appeared on behalf of hundreds of clients in United States Immigration Court arguing against deportation/removal, and demonstrating eligibility for applications and waivers, such as Asylum, Cancellation of Removal and Adjustment of Status among others. Attorney Ogden has also successfully negotiated prosecutorial discretion with the Department of Homeland Security, resulting in the termination of removal proceedings, and has represented clients on a variety of applications before USCIS. Attorney Ogden has also filed many successful briefs with the Immigration Court, Board of Immigration Appeals, and Ninth Circuit Court of Appeals.